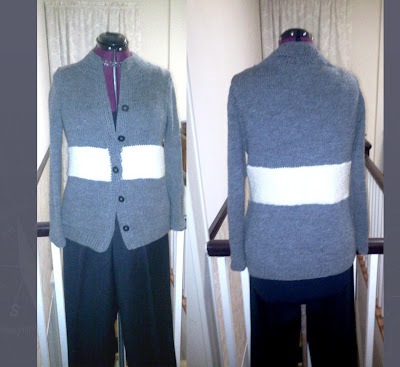 2011 Knit garment.... Yawoowee!... I started this project back in November and with the holidays and other crafting endeavors I worked on it sporadically. Instead of the recommended yarn, I used Gray Plymouth Yarn Encore Worsted and Cream Caron One Pound for the contrasting sections. I thought it would be interesting to add the contrast color to the sleeves, but ummm nerp... didn't like it once the garment was completed. Without a hiccup, I went to my sewing machine and stitched along the beginning of the contrasting band line and then cut off just below the stitching line and did two rows of crochet... haaa much better. The neckline on the pullover sweater is very close to the shoulders and being that it was going to be a cardigan I wanted a closer fit and also needed button bands. Join yarn at the bottom edge of the cardigan and did several rows of crochet. I like your renaming of it. I had forgotten that you were the Queen of Modifications! lol. It's lovely; I think I like it better without that contrasting cuff, too. Good to see you haven't lost your touch with the needles. Beautiful sweater. I love the contrast waistband. Very flattering. 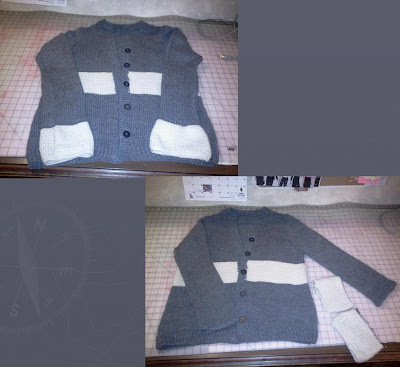 Very nice job on the Boyfriend Cardi. I like your final version very much. Beautiful job as always. Very pretty cardigan, and love the contasting cuff! Very pretty cardigan, and love the contrasting cuff! Wonderful cardigan. Love your colour combination. So cute, love the color contrast. Aren't bigger sweaters in right now? I bet it looks great on! Wow, very nice~ you are just a regular knitting machine,lol!!! WoW Sheila. Your cardigan is beautiful as are so many of your knitting and sewing projects. Your knitting projects almost caused me to take up knitting as another project. After much thought, I decided that would not be a good idea for me at this time. LOL I need to get back to my sewing. Great cardigan! Love the colors too, wish I could find more "yarn" time too! It's very relaxing, isn't it??!! Whatever is choose to call it, weekend or boyfriend cardigan; it super cute. Great cardigan, unbelievable to me how fast you turn these creations out. What's your time management secret? Love the look of this beautiful cardigan!